WHEN IT COMES TO COLD CALLING THERE'S REALLY JUST ONE ICON. All Pop Icon Mr. 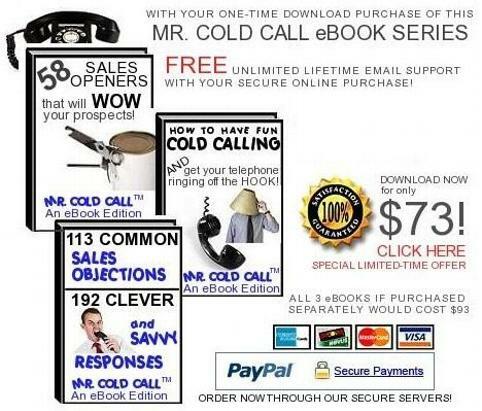 Cold Call eBooks include "FREE UNLIMITED AND LIFETIME EMAIL SUPPORT with your secure one-time online payment! DOUBLE YOUR SALES PERFORMANCE THROUGH THESE PRACTICAL TIPS! When Salespeople Talk About You! Did you hear what Seth did the other day? I really don't like her at all she doesn't know anything! Joe probably gave her the lead.Diane is just lucky and she probably won't be here that long anyway! People complain for two reasons. First, they have too much time on their hands. The second reason people complain is they are jealous of you. If you are aware of these two reasons then this will help you to handle situations in which people talk about you. Just disregard anything they say about you. People who like to talk about others are usually looking for some type of reply, otherwise why would they make a comment about you in the first place? Be silent, be nice and ignore what they say about you.The "Less is More Approach" is your best solution. Keep Things Positive Because Positive Attitudes Are Unstoppable! There is nothing more powerful than a positive attitude. In life and throughout history, no great man or woman has achieved a historic feat without the presence of a positive attitude. Being aware of this secret weapon will always put you on top. When someone talks about you just say to yourself, "In six months, I will still be here." Usually people who complain are not happy people and the probability that they're unhappy with their job is close to 100 percent. What does this mean? This means that you will still be at your job in six months and they probably will not! Copyright 2008 Mr. Cold Call, Inc. - All rights reserved. How To Have Fun Cold Calling and get your telephone ringing off the HOOK! Local Coupon Marketing� Enters Into Exclusive Agreement with Mr. Cold Call, Inc.
Off The Hook Media� Announces Release of "The Mr. Cold Call� eBook Series"
Start Your Own App Business! All Training & Marketing Materials Provided! Click here to see what you get! Are You A Polished Speaker? How Are Your Presentation Skills? Click here to view 3 public speaking programs! Click here to purchase your kit! Start Your Own Local Coupon Business: Fire Your Boss! Learn How to Evaluate Your Prospecting Skills! Power Call your message to everyone's voicemail for about ONE PENNY! Click here for additional information! Copyright 2012 Mr. Cold Call™ is a service of Mr. Cold Call, Inc. - All rights reserved.